Antiseptic Cream for Minor Wounds. Fights infection, soothes and moisturises. Contains Chlorexidine hydrochloride 5.5mg/g. Effective for the treatment and prevention of infection in minor cuts, wounds, abrasions, insect bites and minor burns. The smooth consistency allows gentle application onto damaged skin to help soothe skin, therefore allowing it to heal. 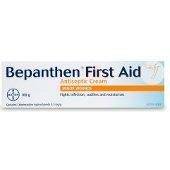 Bepanthen First Aid is free from all colours and fragrances.